Edinburgh is set to get free public Wi-Fi across its bus and tram network in a government funded push to make the city more connected. A tender for the project, which would see 713 Lothian buses and 27 new trams installed with Wi-Fi equipment, was launched in December and closes today. The winner will receive funding from the central government’s watered down Super-Connected Cities scheme, which the Scottish government turned into its own Connected Capital programme in May 2013 to incorporate wireless technologies into the goals, alongside bringing superfast broadband and improved mobile access to the city. “The introduction of passenger Wi-Fi on all of Edinburgh’s buses and trams would be great for our passengers and help the city to become a truly connected capital,” said Ian Craig, chief executive of Transport for Edinburgh. If approved, the contract could be worth up to £2m, but Transport for Edinburgh said the tender process was an exercise to identify potential suppliers and help inform and refine the final business case. 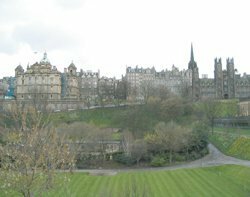 However, the plans have already received the backing of Edinburgh City Council. If a tender gets the go ahead, Transport for Edinburgh hopes to have the network up and running by the end of 2014.